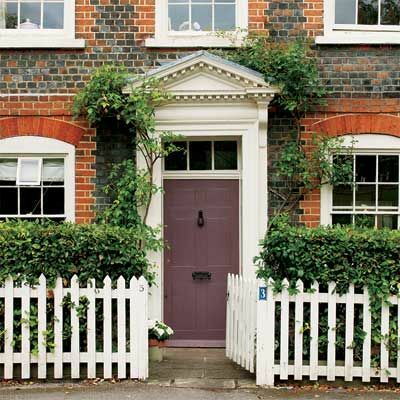 Thinking of changing your front door color? Confused about the choices? There’s only a bazillion possibilities! Let’s take it one step at a time. Typically, your house siding is the resting spot for eyes, whether it is wood, vinyl, brick, stucco, cement board, stone, or some combination. 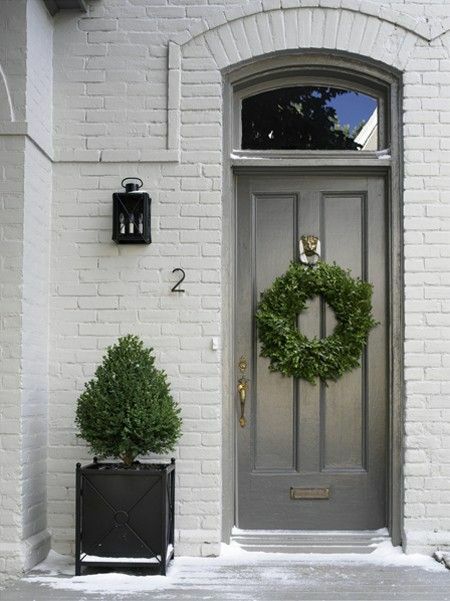 Your front door should punctuate that space and be the focal point of your home, inviting people to approach. For a cohesive look that still attracts attention, choose a door color that has the same undertones as your siding. The undertones can be muddy, or clear or tints of yellow, grey, blue, red, or green. If you're having trouble coordinating colors, talk to an experienced salesperson at a paint store (not a big box store). He can help harmonize colors for you based on what is recommended by the color experts at the company's corporate headquarters. A trained sales clerk can tell you the undertones because stores have the pigment formulas. If your home is a charming cottage, go with a cheerful color like pale yellow or a mid-tone blue. If you own a brick home, stay with colors that don’t emphasize the orange tones, such as muted a green like the one shown above, or a warm grey. If you have a classically restored ranch, a Victorian, a Williamsburg-style, or a Craftsman home, stay true to the palettes that are historically correct. Pick up one of brick's cool tones for a door. This Old House photo. Picture a realtor bringing her clients to your front door. There are those few seconds as the door is being unlocked. Expectations are high. This is your chance to set the tone. The most popular colors for doors are dark greens and olive greens, classic black, burgundy reds, all shades of grey, navy blues or aubergine, along with yellows and creamy whites. When you move to your next home, you can go nuts with that taxi cab yellow or neon pink, but I advise sticking to front door colors anyone could love, just the way you do with interior colors when you are staging. When guests (and prospective home buyers) enter your home through the front door, the first room they see is the entry. Whether it’s a tiny foyer, a grand staircase, or your whole studio apartment, the interior color should talk to the exterior color. They shouldn’t match, but they shouldn’t clash. Your home will seem bigger and more intentionally put together when there is a sense of flow. Big is good in the eyes of buyers. This blue is in the same family as the siding. This Old House Photo. I always suggest that people follow local traditions when staging their homes. It’s an opportunity to cash in on the appeal of local flavor, which is especially attractive to people house hunting because they are relocating from another area of the country. Why try to look like a Nantucket cottage if you live in the desert, or imitate an Iowa farmhouse if you live in New Orleans? Ideally, you’ll strike a happy balance between fitting in and standing out. Pick a color that is not identical to the homes immediately surrounding yours. If your home is not in sight of neighboring houses, you have more leeway. Remember that people are more comfortable buying a home from people they feel simpatico with, people they want to be like. So, don’t be the crazy lady with the multicolored front door. Sure, show some style, but don’t narrow your market. Choose a color that is not the same as the siding, trim, shutters, foundation, roof, steps, lattice, or window boxes. Consider your siding as color number one – the largest block of color. Color number two will be your roof, which should harmonize with your siding. Color three is your trim. Color four is your door. If you have shutters or other details, they should relate to one of these colors, a lighter or darker shade of the door, the trim, the roof, or the siding. Is a red door for you? See what Maria Killam says. 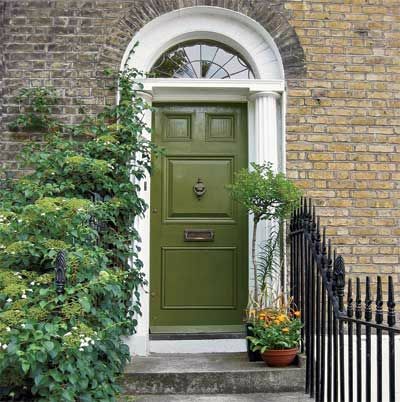 Did you know that some new (and even some not-so-new) homes still have just primer on the doors? Builders can, either through frugality or negligence, leave side doors and back doors without anything more than a factory prime. Often these doors are grey, but they can be white. Do any of your doors look like they received only a quick spray at the factory? Are they showing wear around the edges and knob? It’s time for a coat of paint. Side doors and back doors can match siding or trim. They should not be the same color as the front door. 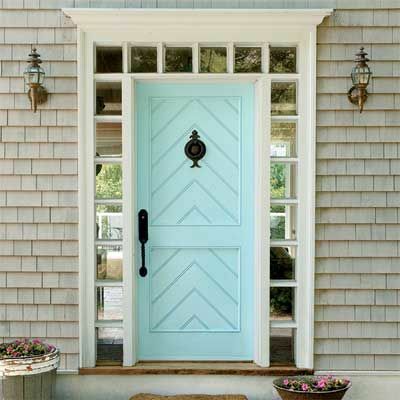 If you have a storm or screen door, painting it to match the front door is one possibility that has worked for some. Others remove the storm or screen door while the home is on the market, for a cleaner look. If you live where your neighborhood association or HOA dictates or limits your color selection, make the best of it by keeping your door in excellent repair and clean. That includes the area around your doorway. Cobwebs and debris seem to find a way to accumulate there overnight. Make sure you have something seasonal to dress up the area and to make the entrance feel fresh and friendly. Don’t plant flowers or shrubs that will fight for attention with your front door. Keep it simple and make the door the magnet that draws buyers. Don't ignore brown, white or grey as possible colors. House and Home Photo. If you own a home with vinyl siding and you and everyone else hates the color, it can be painted. There are paints formulated just for vinyl. I once knew a spec home that was sided with sky blue vinyl. It sat on the market for two years. Finally the desperate builder had the siding repainted a warm, light yellow. The house sold in a matter of weeks. Along the same lines, I once owned a home with aluminum siding that had dulled over time. I was able to brush on a new coat of paint in a fresh color that brought it back to life. Although most people consider vinyl and aluminum siding a plus because it is low maintenance and painting it will require a repaint in years ahead, you might decide painting is necessary to attract a buyer. 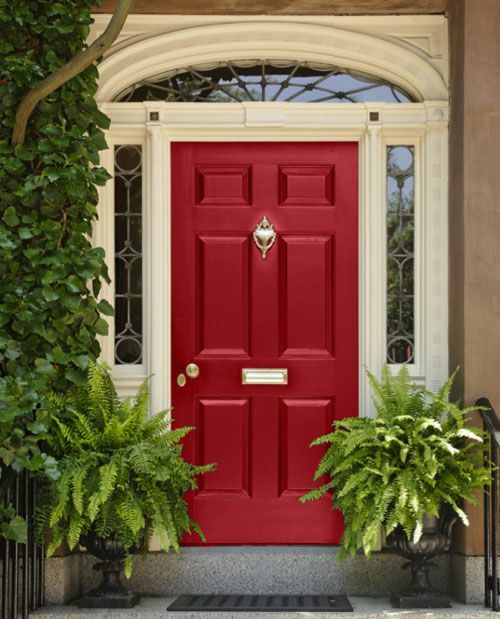 For any exterior door, avoid high gloss paint finishes. A low-luster stain or semi-gloss will wear well and hide any imperfections. If you are sold on a glossy door, your door should be in prime condition. If you want an inclusive, fun post about paint colors in American history, I recommend reading what Joe Davis writes. Your front door is the centerpiece of that all-important view from the street. Painting it yourself is an economical and simple improvement. These guidelines should help you decide on the perfect color. For more tips on boosting your home's value for the real estate market, read my $4.99 eBooks. Top photo: National Builders Supply.